Model 301 Quiet Steam Heaters mix high velocity steam and atmospheric air with water to reduce the noise and vibration characteristic of the release of steam in cold liquid. Atmospheric air, entrained by the steam as it passes through an annular nozzle, cushions the steam bubbles and prevents their sudden collapse as the steam condenses. This reduces the loud cracking noise usually accompanying this process to a low hum. In addition, the air increases agitation of the liquid. A steam pipe, and an air pipe which extends above the liquid level, are connected to the center of the heater. 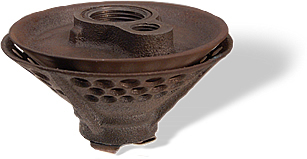 Steam passes from the pipe through an accurately designed annular expanding nozzle, formed by two concentric cones, and issues at a high velocity. The entrainment action of the steam jet draws in atmospheric air through the air chamber, as well as liquid from the tank. The condensing steam heats the liquid and the jet discharges from the heater with sufficient force to circulate the contents of the tank-providing quick, even heating. Usually, these heaters are placed near the tank bottom to obtain maximum circulation. Steam pressure must be high enough to overcome submergence, yet not so great that live steam escapes from the surface of the liquid. 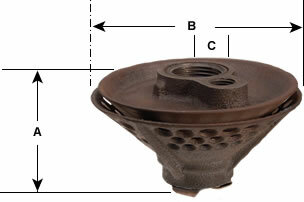 The steam pressure can be set by a valve in the steam supply line to provide the liquid temperature desired. The air line should be equipped with a valve at its inlet so that the air can be throttled if agitation is greater than required. Compressed air may be used if additional agitation is desired. A standard installation is shown in the illustration to the right side of this page. Where required, many special arrangements can be made to meet requirements. 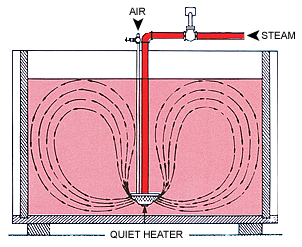 The heating capacity of Quiet Heaters depends upon their size and the pressure of the operating steam. Steam pressures up to 100 psi gauge are normally used. Higher operating pressures cause excessive agitation and splashing while operation at pressures below 15 psi gauge is not recommended since objectionable vibration may occur. To estimate the size of a Quiet Heater required for a specific application, multiply the quantity of liquid (in pounds) to be heated by the number of degrees F. the temperature is to be raised. The result, divided by 1000, gives total pounds of steam required when liquid is similar to water. Divide this figure by the time in minutes allowed for heating and the pounds of steam per minute is obtained. The calculated “heating capacity” divided by the “heating capacity” from Curve A for the same steam pressure will give the capacity ratio. This ratio, referred to in Table 2, will indicate the size of the heater required. CONNECTION SIZE DIMENSIONS IN INCHES NET WEIGHT LBS.